Yes, its a little late but I had a few pressing matters that took priority. Apple had a remarkable blow out quarter in Q4 2011, basically knocking almost everything out of the park. Those who follow me and study my research realize that this was not necessarily unexpected. Those who pay attention realize that Apple has made a lot of money, but the theory behind the margin compression still stands. As a matter of fact, it stands stronger now than ever before. Let's peruse a few anecdotal points, but before we do I want to reveal that I've had more institutional interest in my Apple/Google research (primarily asset management and hedge funds) than ever in the history of my writings. It appears as if some of the thoughtful money sees the writing on the wall as well. Yes, that's a big number. That's very big for annual revenues, but Apple hit it in just one quarter. The problem is that many believe Apple simply hit this number out of organic growth, the quarter after it missed analysts expectations, expectations which have been historically heavily managed. I'm sorry, but this business is just not that volatile, as can be seen below. Below, I drilled down on the date and used a percentage difference view to illustrate the improvement in P/E stemming from the earnings beats. So, what was behind this surge in fundamental performance? Of course there's more to the story. Apple, for the first time, had the iPhone offered on EVERY major US carrier - Verizon, Sprint, and AT&T. This is in comparison with just an AT&T exclusive, and then an offering on Verizon that just capture part of a quarter. When the iPhone (or any extremely popular product ) debuts on a a carrier, there is pent up demand from people waiting for the product availability in order to purchase it. This pent up demand on a product debut through a carrier is unrepeatable. It is a one-time event. Apple had this phenomena... X3!!! Why, you ask? Well, the tech in the Samsung Galaxy (or even the Motorola Razr thin 24 hour phone - that's a real battery, soon owned by Google) is simply no joke - and has significantly pulled away from what is available from Apple. Apple's management is too smart to allow themselves to be Nokia'd, RIMMed or Microsofted so early in the game - so they will pony up the investments and expenditures. For those silly people that believe Apple can buy Samsungs and LGs components cheaper than Samsung and LG can supply themselves - you are simply delusional. Apple broiled in litigation with its two largest vendors, who supply the most important parts to its most profitable products, with said vendor being the number one competitor to said most profitable product. Exactly how is this a positive thing for anybody other than the consumer (which is a very good thing BTW)? Samsung's Galaxy S range of devices have come to symbolise the strength in competition faced by Apple's iPhone. 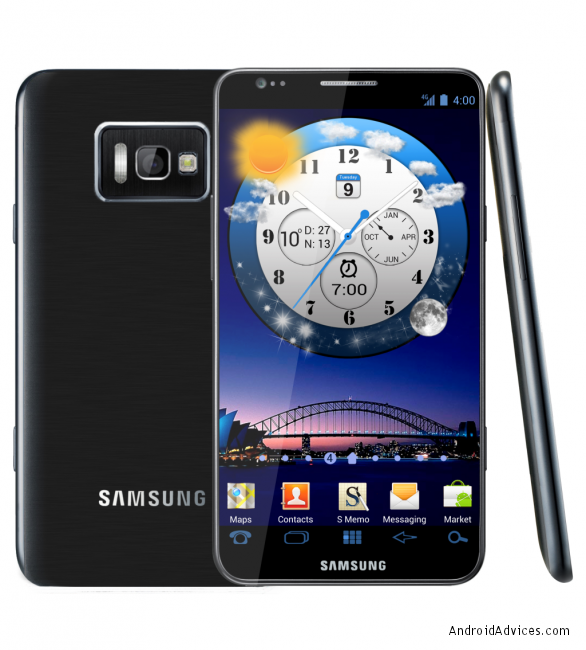 They are highly powerful devices and offer the modern user everything they could want from a top-level smartphone. Anybody who doubts the quality of these devices is a) ignoring that they are the top revenue driver in Samsung's history, b) ignoring that they are the best selling phone in Korea and surrounding areas (besting the iPhone which benefited from a new launch) and c) have probably never even played with the phone because the difference is strikingly obvious. In order for Apple to remain competitive with products such as these, they will have to spend money on R&D, components and software. That means lower margins, particularly lower than the margin spike they just experienced from selling all of those antiquated products last quarter. 10 - 16 megapixel camera, most likely a 12 mp camera. The camera on the current Galaxy is the best in the industry save the 12 - 14 megapixel fringe phones from Nokia and Sony, which no one is even aware of. These specs are all literally twice that of the current generation iPhone, and unlike many previous iterations of the iPhone, Apple has real competition in the market for components now (HTC, Samsung, LG, Motorola, etc.) so it can't buy everything for pennies. As a matter of fact, its biggest competitor IS ITS MAIN VENDOR, whom they are suing in 7 countries (or more)! How's that for a stroke of genius business plan from Google. Android has moved to over 40% marketshare in tablets from less than 9% in less than a year. That's amazing and much faster growth than it exhibited in smartphones - which it literally took over the world in smartphone growth in just a few short years. Apple dropped from just over 90% to just under 60% in the same time frame. Again, as with the smartphones, the tablet tech blows iOS products out of the water and there are enough consumers who actually pay attention to features and capabilities to cause this market shift. My current tablet (I have iPads, Windows tablets and several Androids) is the Transformer Prime. It literally competes head to head with ultrabooks, MacBook Airs, and iPad 2s and does so quite favorably - running circles around ALL of its Apple competition. You can actually do productive work with it. Believe it, because I'm actually creating this post with on right now. Am I the only one that feels this way? The Prime is sold out everywhere, except for scalpers successfully selling them at 30% premiums on eBay. With an 18 hour battery, full keyboard and all necessary ports and plugs, 1080P graphics and the slimmest form factor of any tablet and nearly any netbook, this is a fabulous productivity product and will need real R&D and component sourcing to prevent it from rising even faster than it already is. I can actually do a commercial for this, because unlike practically all other tablets you can really get work done on it. Ask almost anybody who has used one if it is worth it. Go to BestBuy where they sell both Apple and Android and ask three or four salespersons which is the better tablet, by far! Ask them which is the hardest one to keep in stock. After that, ask them which phone is better, the Galaxy or the iPhone 4S, then ask them which their next personal phone will likely be. Go ahead, do some field work. The Apple thesis is based on what will happen in the near to medium term, not what happened last quarter. Remember, I never said Apple will go out of business, I said they will have to spend more to remain competitive against Google's less than free business model, see Looking at the Results of Google's "Negative Cost" Business Model Employed Through Android. Cook has even said himself that one shouldn't expect the margins Apple exhibited last quarter again, and the reason he said it wasn't because he was reading BoomBustBlog that morning - How Google is Looking to Cut Apple’s Margin and How the Sell Side of Wall Street Will Enable This Without Sheeple Investor’s Having a Clue or Sliced Apple Margins For Dinner? or Steve Jobs Calls End Of the PC, We Call The End Of The Fat Margin Tablet – Including The Pretty iPad, With Proof! The Q1 of Apple had an extra week of retail and channel sales in it as compared to the previous quarter, and when moving product at the pace that Apple does, that week makes a difference... A big difference. These nuances need to be noticed and taken into consideration (ex. the revenue miss from Google stemming from FX fluctuations, yet attributed to fundamentals). Last but not least, the unfortunate passing of Steve Jobs did create a boost in mindshare for Apple and Apple products. This is (fortunately) not repeatable unless another superstar CEO passes away - which is highly unlikely. The margin boost from selling decamillions of antiquated product will not be produced in the near term either. The simultaneous launch on multiple large carriers and the pent-up demand will not be repeatable as well. The holiday season quarter lag, probably not. Which CEO had the greatest effect on the world to date, Steve Jobs or Bill Gates? I welcome all opinions and answers, just stay polite and professional.